It has always been an amusing point of conversation when we tell our customers that our personal TV is in fact a tube TV that we’ve had the pleasure of watching since we bought it, in 2004! Our response to those that ask ‘Why?’ is that we moved to Pembrokeshire to breathe some fresh air. A TV doesn’t smell as good. UNTIL THIS WEEKEND, when we decided it was time to embrace new technology and enable some of the products we now use (such as our SMART phone, tablet and digital SLR) to talk to our TV. Having a flat screen isn’t particularly a big seller for us (no practical advantage if you keep it in the corner of the room) and upgrading from a 32” to a 40” isn’t particularly noticeable, however being able to access photos from the PC and show them to friends and family, watching programmes we actually want to watch via on-demand TV and browsing the web are all big pluses in our book. Dave has had the pleasure (!) of accessing and testing the features of almost every TV brand available. Ask for his recommendation of a ‘quality’ product and he never defaults from Panasonic or Sony. However, since the SMART revolution and the move towards internet enabled sets, he has watched Samsung enter the market with interest and is pleased to see some much needed, forward-thinking technology. Samsung has now joined Dave’s hit list of preferred TV brands for innovation, quality, reliability and ease of use. Of course, if your budget doesn’t stretch this far, there are plenty of other brands to be considered. The decision on screen size is generally guided by; 1. How you want it to look aesthetically, 2. How good your eyesight is. It’s down to personal preference and taste. For some, the larger the better (John Lewis are selling TVs up to 90” for just under £11k!). For others, practicality and budget remain priority. Think about your sitting distance when you ‘going large’ and how much head turning it will demand. Select a size that will compliment your interior and fit into existing spaces (next to the fireplace or between cupboards on a kitchen wall). Check the practicalities, such as being able to read the programme guide clearly from the sofa. Dave’s tip to reap the full benefit of High Definition (HD) channels, is to purchase a screen size of 40” upwards. Anything smaller than this makes HD fairly hard to detect. It’s also worth bearing in mind that your TV will only display a high definition picture if the source of the footage is filmed in HD, i.e. many of your favourite classics and comedy repeats were filmed in standard definition, way before the HD feature was available. The quality of the picture in this scenario will remain the same no matter how large your budget is. The good news is that prime TV channels are gradually starting to broadcast in HD, meaning better quality viewing for all moving forward. TV stand or wall bracket? One of Dave’s biggest frustrations is when a customer asks him to hang their flat screen TV on the wall, usually above the fireplace. In theory, this sounds like the contemporary thing to do, but when you’ve done the ‘sore neck test’, you will realise that the recommended height for watching a TV from your sofa is no more than 2-3 feet off the ground, within the natural line of sight. If you have a friend with a TV hung high, try watching it for half an hour or so and notice how comfortable your neck feels. Is it straining? In answer to stand or wall bracket, we recommend both. It’s the height that counts. Described as Hz (short for ‘Hertz’) in the promotional ‘list of features’, the Hz level indicates how fast the picture is refreshed when watching fast-moving images, in sports or action movies or when gaming. In theory, the higher the motion rate the better. Cheaper TVs have a low Hz (from 50Hz), the more expensive TVs display at 400Hz or higher, ensuring pin sharp picture quality and minimal motion blur. It is important to note however, that you can’t add detail beyond what is already in the source footage (we’ll leave you to do your own research on this!). 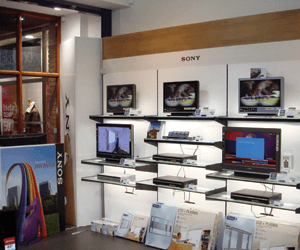 Compare models in your nearest TV showroom to understand the difference and decide how important it is for you. A ‘SMART TV’ is a TV that is able to access internet services. Many of the latest TVs are now SMART, meaning you can access TV on-demand (BBC iPlayer, 4 On-Demand, etc. ), browse the web, catch up with social media and access files from your PC. You can even attach a wireless keyboard to some models to convert your TV into a super-sized PC. SMART was a key priority in choosing our TV, however if you are more interested in viewing and recording traditional (live) TV, having these features is perhaps unnecessary. Our advice is to go for SMART (if budget allows) to satisfy any need you (or your grandchildren!) may have in the future. We hope some of the above has been useful to cover the basics. If you’d like to explore your inner geek further, take a look at PC Mag’s more detailed guide on How to buy an HDTV. NB: Images included are not intended for promotional purposes. 1a Aerials is not a retailer of Television sets but is happy to provided recommendations based on professional experience.